The Park Concession operates daily snorkeling tours to the Looe Key National Marine Sanctuary. Featuring one of the most spectacular reefs in the Florida Keys with plentiful Elkhorn and massive Star coral, Looe Key has become a major destination for snorkeling enthusiasts throughout the world. Daily departures are 9:30am, 1:30pm and/or 4:45pm daily. 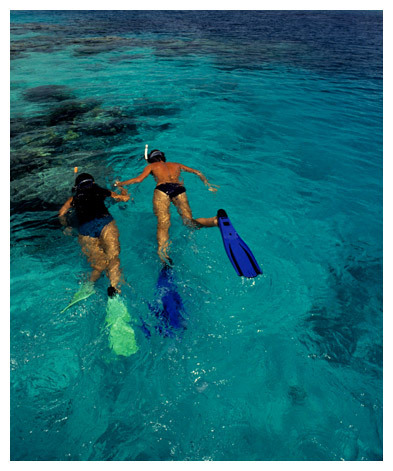 Each trip provides 1.5 hours of snorkeling, plenty of time to explore this fabulous coral reef. Make an online reservation or call 305-872-3210 for further information. All prices and schedules are subject to change without notice. Minimum passenger requirement on all tours. Reservations are recommended for all tours and must be confirmed in person no later than one hour prior to tour time. Boats leave the dock promptly at published time. Schedules subject to seasonal change. Minimum Passenger Requirements apply to all snorkeling trips. rented for day use at any of the park's swimming areas. Deposits Required on All Equipment Rentals.